Projectors are our friends. When they’re not busy showing movies, they can also throw supportive light on large surfaces. Well, at least if you have a ginormous projector, that is. At yesterday’s OWS march, starting at Foley Square and slowly making its way across the Brooklyn Bridge, the massive crowd was fueled on by a bat-signal of sorts, projected onto the flat window-less surface of the Verizon building. It was the handywork of a certain Mark Read and some of his friends, and you can read about how it all came about here. 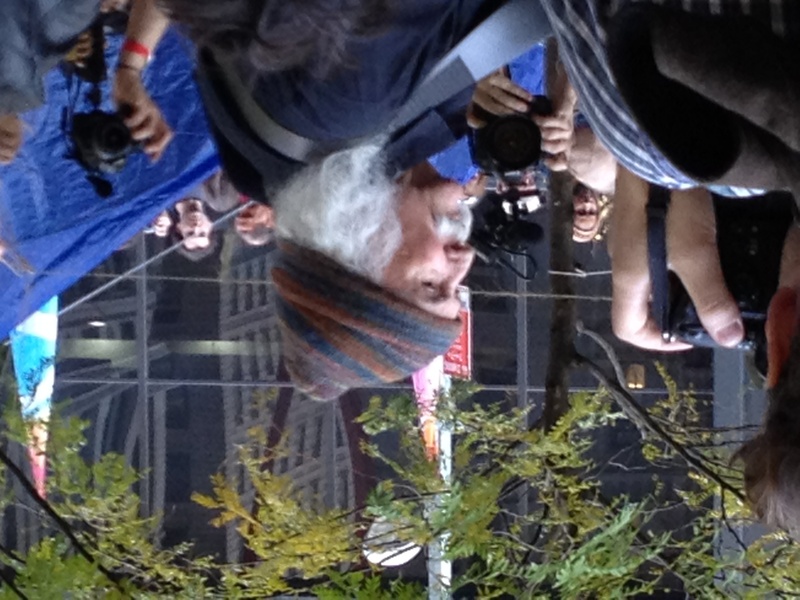 Our friend Bill Mac took this photo of David Crosby (with Graham Nash) the other day on Wall Street. A bit of a musical flashback- Bill filmed with us during a Patti Smith/Ralph Nader rally down on Wall Street some years ago.